(SitNews) - Fewer men and women went out fishing in Alaska last year, in a familiar cycle that reflects the vagaries of Mother Nature. A focus on commercial fishing in the November Alaska Economic Trends by the State Department of Labor shows that the number of boots on deck fell by five percent in 2016 to 7,860 harvesters, driven in great part by the huge shortfall in pink salmon returns and big declines in crab quotas. Fishing for salmon, which accounts for the majority of Alaska’s fishing jobs, fell by 6.4 percent statewide in 2016, a loss of 323 workers. The only Alaska region to show gains in fishing jobs last year was Southcentral, which includes Prince William Sound and Cook Inlet fisheries, as well as fishing boats out of Homer, Seward and Kenai. All of the region’s fisheries added jobs in 2016, even salmon, scoring the state’s second-highest total employment at 1,661 harvesters. Southeast Alaska had the state’s largest slice of fishing jobs in 2016 at 29 percent (2,275 fishermen), but that reflects increasing declines for the third straight year. The Panhandle’s harvesting employment dipped 0.8 percent in 2015 and then 2.3 percent in 2016, a drop of 53 jobs. Fishing jobs at Kodiak fell by 8.5 percent in 2016, erasing the job gains of the few prior years. That reflected a poor salmon season, where fishing jobs dropped 14 percent, combined with slight drops in fishing for pollock, cod and other whitefish. Bristol Bay, where fishing jobs rely almost entirely on salmon, took the hardest hit last year. The 1,276 permits fished reflect a loss of 133 fishing jobs, or 9.5 percent. For Alaska crabbers, fishing jobs were down by nearly 19 percent to 464 persons, a loss of 107 fishermen and the lowest level since 2009. That was due to lower crab numbers and a called off Tanner crab fishery in the Bering Sea. The crab cuts cost the Aleutians and Pribilof Islands more than 122 fishing jobs in 2016, a 7.8 percent decline. 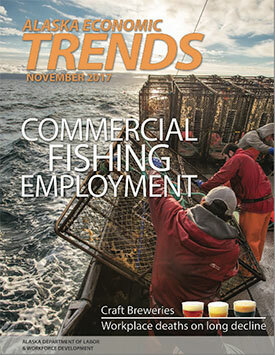 Looking ahead, state economics said reports of record catches and a 67 percent higher payday for Alaska salmon fishermen this year suggests a resurgence in harvesting jobs for 2017, while other catches, such as cod, appear weaker. Fourteen new Alaska seafood products will be showcased and judged this week at Pacific Marine Expo in Seattle. The products are competing in the annual Alaska Symphony of Seafood, hosted for 25 years by the Alaska Fisheries Development Foundation. In the foodservice category, the entries are Smoked Black Cod dip by Saltwood Smokehouse in Seward, Hot and Spicy Wild Alaska Pollock Fish Sandwich by Trident Seafoods, and Alaska Sockeye Salmon Bites by Orca Bay Seafoods. Saltwood also entered its dip in the retail category, along with Kelp Campfire Salsa by Barnacle Foods of Juneau, Smoked Sockeye Trio by Trapper’s Creek Smoking Co., Wild Alaska Skillet Cuts by Trident, Jack Link’s Salmon Jerky by Link Snacks of Minnesota and Alaska Flounder Parmesan with Marinara by Orca Bay. The Beyond the Egg category, intended to introduce more roe products, attracted one entry – Trident’s Barako Style Wild Alaska Pollock Roe, meaning it comes in a squeezable tube. Beyond the Plate entries highlight the many items that can be made from fish byproducts. Cod Crunchies Pet Treats by Alaskan Leader Seafoods is competing against three crab shell-based entries from Tidal Vision LLC of Juneau: High Tide, a plant immune booster, Game Meat Protector, a spray that prevents spoilage and repels insects, and Crystal Clarity, a 1% Chitosan Fining Agent for beers, wines and other beverages. Symphony winners receive a free trip and booth space at Seafood Expo North America in Boston in March. The eight-month Pacific halibut season ended on November 7, with Alaska longliners taking 96 percent of their 17.6 million pound catch limit. Kodiak led all ports for halibut landings topping 3 million pounds, followed by Seward and Homer. The industry will get a first glimpse of next year’s potential catches at the International Pacific Halibut Commission meeting Nov. 28-29 month in Seattle, and final numbers will be announced in January. The Alaska pollock fishery called it a wrap on November 1 with a catch topping three billion pounds. The pollock harvest is pegged at that amount for 2018. The North Pacific Fishery Management Council will announce catch limits for pollock, cod, flounders and myriad other fish species under its purview during its Dec. 4-12 meeting in Anchorage. The state Board of Fisheries meets Dec. 1-5 in Valdez to take up commercial, sport, subsistence and personal use fisheries at Prince William Sound and the Upper Copper and Susitna River regions. A one-hour training session on “How to Navigate the Board Process” is set for Dec. 1 during the noon break. Frances Leach of Juneau will take the helm at United Fishermen of Alaska, the nation’s largest commercial fishing trade association. Leach currently works in the commercial fisheries division at the Alaska Dept. of Fish and Game. “Having grown up in a commercial fishing family in a coastal community (Ketchikan), I understand the importance of commercial fishing to Alaska’s economy and cultural heritage. The commercial fishing industry faces many challenges at the state and federal level, and I look forward to addressing these challenges as UFA’s Executive Director,” Leach said in a press release. UFA represents 34 member organizations from fisheries across Alaska and its offshore waters. Leach will begin her new job at UFA on January 5. So reads the recent headline in The Times UK announcing that, unlike cowboys eating gassy beans, in this case it is shellfish that are producing vast amounts of methane. Researchers off the coast of Sweden revealed that underwater flatulence by mussels, oysters and clams produced one-tenth of greenhouse gases released in that part of the Baltic Sea, equivalent to 20,000 cattle. The Stockholm University scientists said they believe the shellfish are farting more robustly due to increased digestion of agricultural fertilizers in coastal waters.